For the past two years, my good friend Kerry has invited me to a passover seder at her house. Their seder is a joy-filled, long evening full of readings, singing, drinking and lots of laughter. With spring blossoming around us, it's a wonderful time of year to get together. Around the table, we enjoyed the last of the winter vegetables in a matzoh-ball soup and spaghetti squash roasted to perfection. I didn't grow up with passover, so this is a new holiday for me. And since I am bad at following rules in the kitchen, cooking kosher presents new challenges. Last year I made David Lebovitz's Chocolate-Covered Caramelized Matzoh Crunch -- what Kerry affectionately calls "matzoh crack." Given the rave reviews, and the "tradition-making behaviour" holidays always seem to inspire, I thought I'd try it out again this year. But this time, I decided to get a little more experimental with my flavors. The basic idea: nuts + complimentary flavors. Pistachio + rosewater and cardamom. Almond + orange zest. Hazelnut + cocoa nibs. And toasted coconut, because that's delicious on just about anything. The results were pretty spectacular, if I do say so myself. My favorite was definitely the pistachio. My husband was initially skeptical that the "punch-you-in-the-nose-rosewater" would fade quietly into the background. But it surprised us, mellowing out and balancing the cardamom perfectly. The orange zest with some orange extract for extra kick was also a hit. Surprisingly, the more boring flavors were less popular -- take that boring-ness! If you're making these for passover, there are few things to keep in mind, depending on the tradition you're following. If you're going to have meat at dinner, I don't think you can have butter too, so omit the toffee-butter or switch to margarine. In addition, not all vanilla is kosher, but the one I had was, so just check the bottle. More broadly, I am very far from being an expert on these things, so if you're going to a formal dinner, don't just trust my advice! This dessert is fairly unorthodox, so to speak. 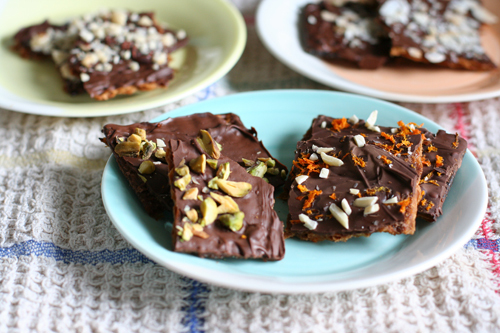 These matzoh candies are delicious, with or without a holiday to urge their making along. They taste like skor bars, and are a blank canvas to paint flavors onto. I've got lots of ideas below, but feel free to get creative and whimsical. The toffee and chocolate can handle a little experimentation just fine. Posted in dessert, holidays and tagged with chocolate, almonds, matzoh, orange, pistachios. March 26, 2013 by Leah.